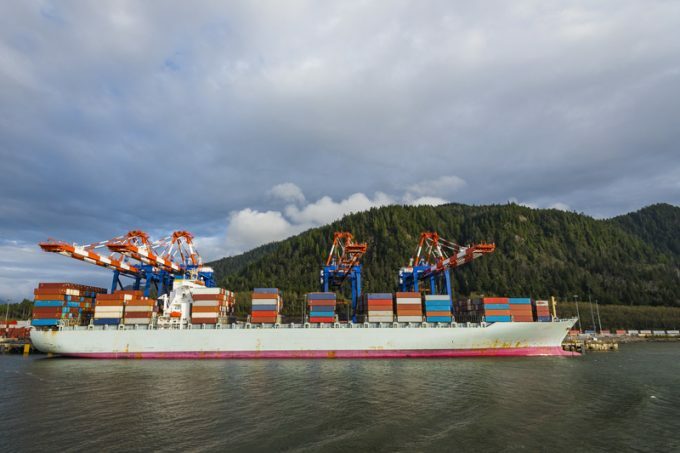 Canada’s Pacific port of Prince Rupert is looking to stay ahead of the demand curve to avoid a repeat of the problems that bogged down container flows last winter. It has officially kicked off the next phase of the expansion of its Fairview container terminal, which will take port capacity to 1.8m teu, a 33% increase from its current capabilities. The project is due for completion in 2022 and will expand the container yard from 32ha to 41ha and add three gantry cranes, two rubber-tyred units and an eighth dock gantry crane. Additional container storage space will be created by the relocation of the buildings that house maintenance and administration. To boost rail capacity, 2km of track will be added for a total of 7.5km at the dock. This is a sensitive spot – it was problems with rail capacity that led to a pile-up of containers last winter, stretching container dwell times to as much as seven days, twice the norm. Ironically, those problems were caused by the final phase of an expansion drive that added 500,000 teu capacity to the port. Work had progressed without a hitch, but at the final stage some rail track had to be removed for the installation of new gantry cranes. Faced with an unexpected surge in traffic, the diminished rail capacity quickly turned into a bottleneck. The situation was exacerbated by severe weather that slowed train movements to and from the port. Moreover, Canadian National, the main rail operator serving Prince Rupert, suffered a deterioration in performance that has been attributed to shortages in locomotives and manpower as much as adverse weather. The rail giant, which came under severe criticism from Canadian grain exporters struggling to move their traffic, promised new investment. As part of a C$340m (US$257.75m) investment in British Columbia province this year, CN is creating four new rail sidings between Prince Rupert and Jasper and extending another three on the route to alleviate bottlenecks. In addition, it bought new locomotives and boosted staff numbers, having been accused of under-investment in these areas which contributed to winter problems. “Things are back to normal,” said Karl-Heinz Legler, general manager of customer Rutherford Global Logistics. The management at Prince Rupert aims to reduce container dwell times to 2.5 days. Last year’s expansion pushed capacity to 1.35m teu, while the port’s throughput for 2017 was 926,540 teu, up 26% from the previous year. The momentum has slowed this year, however, with container volumes up 18.7% in the first quarter. But throughput is set to grow faster in the remainder of this year, thanks to the start of a fourth weekly container service in April when The Alliance brought in the first vessel of a new loop. Originating in Tianjin, with stops in Qingdao, Shanghai and Busan, the service uses Prince Rupert as its first port of call in North America. While inbound container volumes have been on a roll since the facility opened a decade ago, the port’s management is eager to stimulate outbound flows. In March, it launched a C$250,000 export development fund to assist eligible communities and organisations to develop new export opportunities. Last August, as part of the expansion drive, the port opened a transloading facility for pulses and cereals and other agricultural crops from hopper cars to ocean containers for export. According to the port authority, the 10-acre facility is the only unit train stuffing facility on Canada’s west coast. However, agriculture exports from the US to China are more likely to diminish as the two nations escalate their trade war.